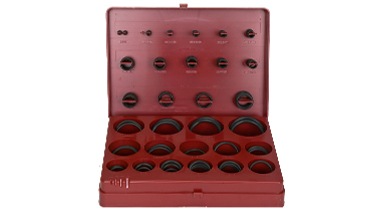 The RT Dygert Deluxe O-Ring Kit is widely recognized as the industry standard. It contains 382 O-Rings in thirty popular AS568 sizes with a detailed, generic contents identification on the outside top cover. The attractive solid red styrene box features post and recess style O-Ring retention. The O-Ring material is 70 durometer nitrile (Buna N). For more information on nitrile, please click here.